A native of Phoenix, Arizona, Troy Kotsur told us that he was the only deaf person in his family. He attended Phoenix Day School for the Deaf, but then transferred to Westwood High School in his sophomore year, as PDSD had no theater program. He studied theater at Westwood and played basketball; all of his teammates were hearing. "It was an interesting experience," he says, moving between Deaf and Hearing communities and cultures. He attended Gallaudet University from 1987 to 1989, studying Theater and TV/film. His first play was Susan Zeder's In a Room Somewhere, directed by Victor Brown, in 1989. He also played varsity basketball. In March 1988, he witnessed the Deaf President Now! movement—a high point of his experience at Gallaudet. He left Gallaudet when he got his first professional offer—NTID's touring company, Sunshine Too, 1990-91. 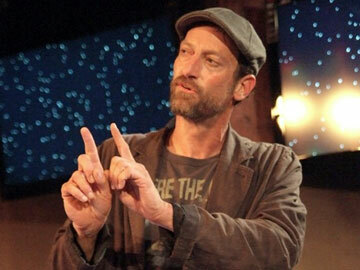 From there, he joined National Theatre of the Deaf for two years, performing in Treasure Island (1991-92 tour) and, as Hamlet, in Ophelia (1992-93). Since 1994, he's worked with Deaf West Theatre in Los Angeles, participating in numerous productions, acting and directing. "I've learned so much from the people I've worked with—directors, actors, veteran actors, workshops, etc." These theatrical workshops have a way of bringing people together. He met fellow Deaf performer Deanne Bray, who's probably still best known for her title role in PAX TV's Sue Thomas: F.B.Eye 2002-2005). "We became best friends. That's how we ended up together—and we've been together for almost 14 years." Their daughter, Kyra, is 7. She's hearing, but knows ASL. Kotsur has a growing list of TV credits. His most recent appearance was on CBS's Criminal Minds (September 26), playing a bad guy. As for his most recent theatrical appearance, he played the lead role in Stephen Sachs's Cyrano, a co-production of the Fountain Theatre and Deaf West. (Sachs wrote Sweet Nothing in My Ear, which premiered at the Fountain in 1997, and was adapted for Hallmark Hall of Fame in 2008; the original ending is more tragic and ambiguous than the happy ending of the TV version.) Cyrano is Sachs's multimodal (ASL and spoken English), modern-dress adaptation of Edmond Rostand's classic heroic-tragicomedy, Cyrano de Bergerac, minus the fake nose, Cavalier costumes, and swordplay, with a Deaf twist: Kotsur's Cyrano is a brilliant ASL poet who loves the alluring hearing woman, Roxie—but she has a yen for Cyrano's loutish rock-musician brother Chris, and doesn't understand ASL. The cast of 13 included six Deaf performers. Kotsur was onstage throughout the play. Cyrano premiered in late April 2012, got rave reviews, sold out, and was such a hit that its original run was extended twice, closing in late July. Sachs calls it "a huge success." Kotsur was nominated for an Ovation Award (Los Angeles's counterpart of Broadway's Tony Award) as Best Lead Actor in a Play; Sachs was likewise nominated for Best Original Play. The awards are slated for November 12.